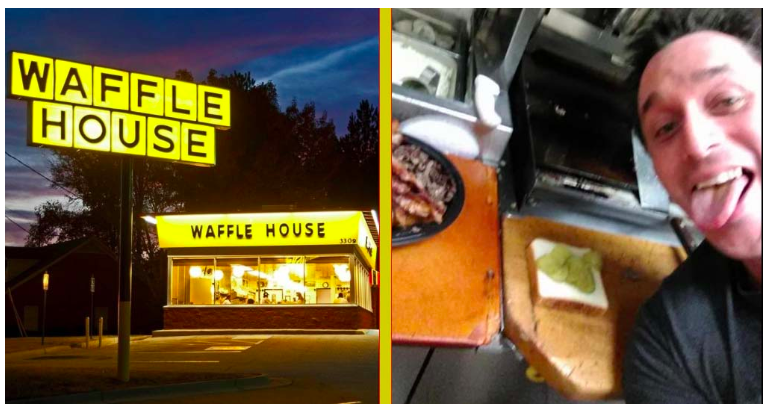 Only awesome things happen early in the morning at South Carolina Waffle Houses. Alex Bowen was hungry and a little bit drunk (Drungry?) early Thursday morning when he stopped by his local Waffle house in West Columbia, South Carolina for sum grub. After waiting at the register for about 10 minutes without service, he noticed an employee taking a nap in the back. Since Bowen is a nice and courteous (and slightly drunk) person, he decided to let the employee enjoy his slumber. And being the man of action that he is, Bowen hopped the counter, fired up the grill and prepared his own meal! And because we live in the age where nothing counts unless it is on social media, he posted on his Facebook page throughout the cooking process! Before you call theft on this tom foolery, Bowen did return later in the day and left $5 for the meal. It got such notoriety that even Waffle House corporate felt the need to release a statement about the incident. They give praise to Bowen by offering him a job…after suspending the dozing employee for a week. If anyone has ever earned a “Straight Outta Waffle House” T-shirt (aside from Kid Rock), it is Alex Bowen! Next Find your Zen With KFC’s New Gravy Scented Candle and KFCHILL Website! hhaha this is so funny! Wow. I mean I get that he was hungry but yeah, not very safe. And there was only 1 employee working at the time? Hmm… Well, at least everyone was OK. haha! I would never think to do this. Makes for a good story though! hilarious story. Its crazy that there was apparently only one employee in the entire store. This is hilarious! I would never even think about cooking my own meal if someone was asleep, probably just leave. Glad he didnt get into any trouble over it.